DRD Tactical Aptus Weapon System 5.56mm NATO/300BLK (300 Blackout) Multi-Caliber SBR/PDW/Carbine/DMR Combat/Tactical Rifle System with Quick Change Barrel (QCB) System, Internal Recoil Sysstem, and Folding Stock! | DefenseReview.com (DR): An online tactical technology and military defense technology magazine with particular focus on the latest and greatest tactical firearms news (tactical gun news), tactical gear news and tactical shooting news. DRD Tactical Aptus Weapon System 5.56mm NATO/300BLK (300 Blackout) Multi-Caliber SBR/PDW/Carbine/DMR Combat/Tactical Rifle System with Quick Change Barrel (QCB) System, Internal Recoil Sysstem, and Folding Stock! 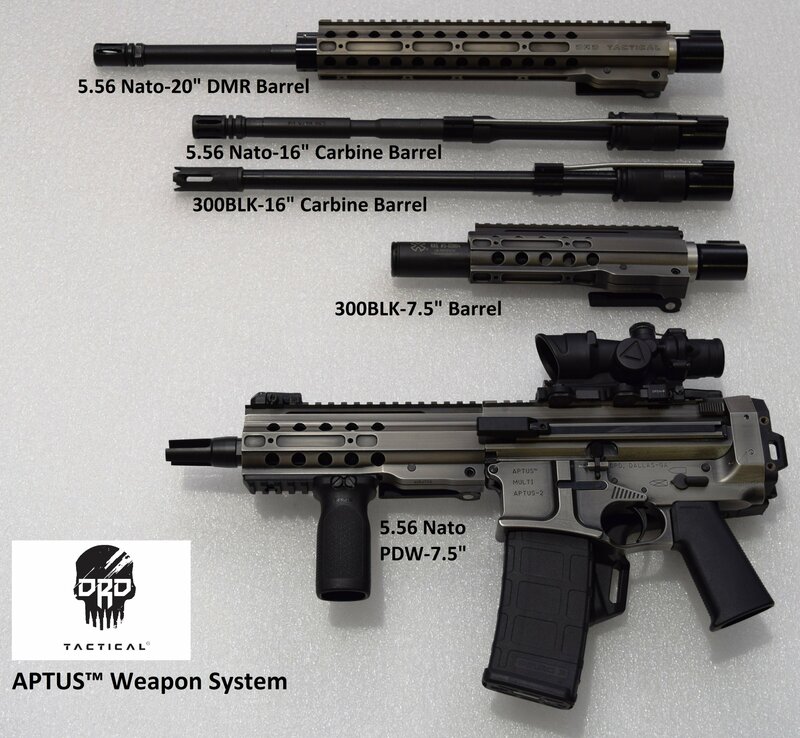 DRD Tactical, maker of the Paratus and KIVAARI rifle/carbines, recently published a press release on the new and very cool DRD Tactical Aptus Weapon System 5.56mm NATO (5.56x45mm NATO)/300BLK (300 Blackout) Multi-Caliber Short Barreled Rifle (SBR)/Personal Defense Weapon (PDW)/Carbine/Designated Marksman’s Rifle (DMR), and it looks pretty badass. 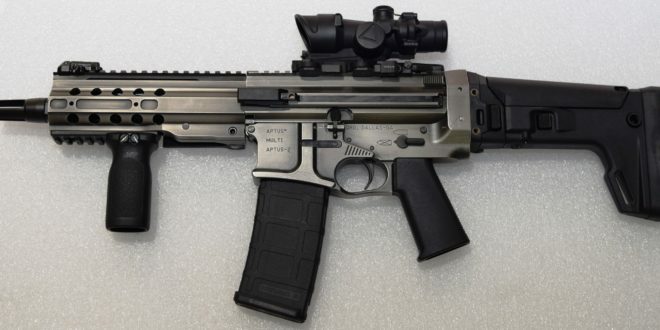 You also get a folding stock (thanks to the weapon’s internal action spring), folding side charging handle, modular tactical handguards/rail systems/forend rail tubes, and DRD’s nickel-boron (NiB) Battle Worn Finish, which DR really digs. Not bad. Not bad at all. Defense Review an’t wait to run this one. In the meantime, DefenseReview (DR) hopes to handle it at SHOT Show 2017, as it looks every bit as impressive as DRD Tactical’s previous offerings. Dallas, GA: DRD Tactical is happy to introduce our new Aptus™ Weapon System in 5.56Nato and 300BLK calibers. Our latest rifle is designed using our patented quick change barrel and internal recoil system. It is a direct gas operated rifle with Magpul folding stock and left sided non-reciprocating charging handle. Aptus™ Rifle allows the operator to go from PDW to Carbine or DMR configuration in less than one minute. Another major advantage with this weapon system is parts compatibility with standard AR15 parts. The Lower receiver parts, magazines, barrels and some bolt carrier group parts can interchange with mil-spec parts. DRD Tactical specializes in design and manufacturing of patented quick take down Rifles in 338 Lapua Magnum, 7.62Nato, 6.5Creedmore, 5.56 Nato and 300AAC, in our modern CNC manufacturing facility. Previous: Prosthesis 14-Foot Quadrupedal ‘Anti-Robot’ Racing Robot: Manned Exo-Bionic Robotic Exoskeleton Runs 50 MPH! Is it a Future Infantry Warfighting Machine? Next: Hudson H9 Low-Bore-Axis Striker-Fired High-Capacity 9mm Combat/Tactical Pistol: Taking the 1911 Pistol Right into the 21st Century!